After therapy ends, what will become of your client with aphasia or related communication disability?About 90% of people will end up sitting at home on the couch watching TV. They will have dinner with another family member or close friend once a week. That’s it. You’ve done your best therapy so the person can express themselves. Now do your best with a referral that will let them practice and put those skills to work. 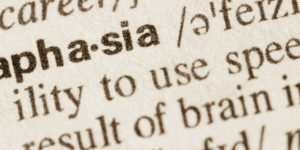 Download our Aphasia Referral Form here.. When you complete the referral form, we can follow up with your client. People with aphasia and their families have a lot to deal with, so letting us follow up eases their burden. Our programs will help your client with aphasia continue to improve, regardless of continued insurance benefits. All of our programs are pay-what-you-can. If your client is still in therapy, we can work with you to maximize progress. If your client is ending therapy, we can keep supporting all of the things you have worked on.